Tweets only tonight. Headed to bed early. I do have a few things to write about concerning my sleep schedule (or lack of), workouts and my blog writing schedule. I really want to do this--but tonight, I'm making the wiser decision and hitting the pillow instead. It's all good things. And it all centers around turning up my accountability in the sleep schedule department--and the things I plan to do in support of this issue. It's an issue I can't afford to continue taking lightly. I found a decent balance of work and rest this holiday weekend. I did sleep-in well three mornings in a row and I'm hoping it hasn't set me up for a rude awakening come early morning Tuesday. It might take some adjusting, physically and mentally! You may have read a mention of Kristin occasionally in these pages. Kristin and I have been dating for some time. I've learned hard and valuable lessons in keeping certain things private and extending courtesy, respect and consideration to those in my life who didn't sign up for having their personal life splashed across these writings. I share my life and experiences as a powerful accountability, support and self-educating tool for my own personal development. I also share in hopes that it might help someone else along the way. This blog continues to accomplish those important missions. But, in being an open book, I must remain mindful of how much I share about others around me, unless they've given me their full and complete blessing on a particular topic or event. I haven't always applied this level of awareness and consideration. Again--I've grown. I attended a Memorial Day get together at Kristin's parents house this afternoon. I had the opportunity to meet a bunch of her family. They're great people! I brought the ingredients for my signature guacamole and I absolutely loved preparing it for everyone. Kristin's mom was so kind and thoughtful. She knows I'm abstinent from refined sugar, so she set aside some of the brisket, minus the sauce, just for me. It was a wonderful experience full of good conversations. I had quite a bunch of work to get done this afternoon and evening, some for me, some for the radio station and I allowed it to slightly tilt my day, but again--my choices and no complaints. It was a great day. The registration period for the upcoming eight week weight loss teleconference support groups opened today! I co-facilitate these groups with Life Coach Gerri Helms and Life Coach Kathleen Miles. The Monday night session starts June 6th at 7pm Eastern, 6pm Central, 5pm Mountain and 4pm Pacific. The Tuesday night session starts June 7th an hour later at 8pm Eastern, 7pm Central, 6pm Mountain and 5pm Pacific. Both groups are combined into one secret Facebook group where everyone provides powerful accountability and support for one another. Group members also have access to spot support via text and calls. This is a very powerful group. The cost is $120.00 for the eight week session. We keep it small, limiting registration to ten participants per group. A limited number of spaces are open. If you're interested in signing up, the links are below. Today, I maintained the integrity of my maintenance calorie budget, I remained abstinent from refined sugar and I exceeded my daily water goal. I'm grateful for another great day. Today was simply a great day. It's days like these that remind me of how much I have to be grateful for in my life. I spent time with Noah and mom for lunch and a visit to the cemetery. We placed flowers on the graves of loved ones. Noah may not have fully understood what we were doing, but at one point, as he crouched down over the marble, gazing down at the name of his Uncle Shane--it appeared he understood we were doing something special. I made it back home this evening, then over to prepare dinner with Kristin at her place. We made shrimp alfredo with mushrooms using Joy Bauer's alfredo sauce recipe. It was fabulous! Several wonderful people have found my book since my appearance on the Today Show. Lately, I've heard from many of them with positive reviews. I do things differently today than I did back then, namely my abstinence from refined sugar and my accountability and support measures have been turned up much higher. But even though my personal plan has evolved from the time Transformation Road was written, I still stand behind the book all the way. Clearly all things in moderation doesn't work for me, although my initial weight loss happened with this approach. For some, it's still workable that way. The mental and emotional dynamics do not change and truly, that's the area where the book most resonates with readers. I'm proud of the book. If you're interested in receiving a signed copy directly from me, simply click the book cover on the left hand side bar of this blog. It'll take you to the order page. It's also available on Amazon in paperback, Kindle and if you prefer to listen to books, there's even an Audible version. I received a fantastic book review today from Kathy B. on my Facebook page. "I've been anxiously awaiting a book and it came on Thursday, just in time to have for the weekend! TRANSFORMATION ROAD by Sean Anderson. Sean travels the same roads that many of us do. Has he figured out what everyone else seems to be overlooking? Quite possibly! Is it magic? No! Do you have to work at it? Absolutely! I picked up his book and literally couldn't put it down until I finished it! He started his weight loss journey at 505 lbs! I feel guilty complaining about the 25-30 pounds more that I want to lose! This man needed to lose 275 lbs! So, what did we have in common? Everything! He ate when he was happy, sad, stressed, to celebrate, as a reward. Me? Guilty!!! The reasons were different but the comfort that food brought was the same. We were addicted to food! His story hit home in so many areas for me. Almost as if it was written for ME to read! If you or someone you know is struggling with food addiction this book is written to give hope! This is the most positive book about losing weight I have ever read. Thank you for writing it, Sean! Check out his blog The Daily Diary of a Winning Loser, too!" Kathy, thank you! The excess weight is relative to the individual--one person's 25-30 is another's 150. As you discovered, regardless of the weight, the mental/emotional elements are remarkably similar for all of us. I sincerely appreciate your amazing review! I shared a story in my reply to Kathy that I don't remember sharing publicly in these pages. Maybe I did-- but I don't recall. Before it was published, the publisher hired a literary critic to thoroughly review the manuscript and suggest changes that, in her professional opinion, the book needed. She obviously didn't relate because she tore it up from start to finish--and basically advised a complete rewrite of the book--especially the first ten chapters. In a meeting I'll never forget, I stood behind my work and refused to change a single thing. In my opinion, there wasn't a 'right or wrong,' only on honest depiction of the story. Every time I read a review like yours and I read one of the most common phrases used time and time again, "I couldn't put it down," and I read of how different people connect and relate in deeply resonating ways--I think of that meeting--and how it brought the publishing process to a grinding halt for some time. I sometimes wonder if that literary critic even knows of how this book, still in the form she reviewed, has connected with people? Probably not. It was a strong lesson in standing up for what you believe in and if your passionate pursuit is in line with your most sincere and genuine heart, it's really hard to go wrong. Again, thank you! Your support is a gift. 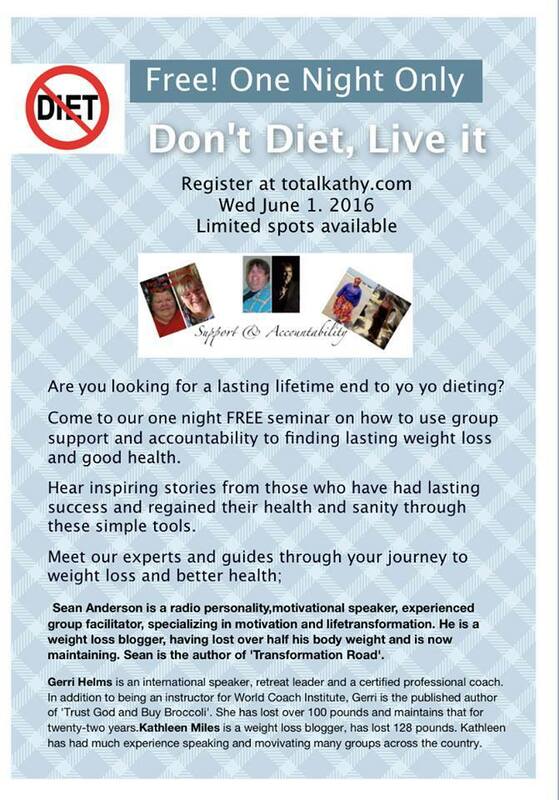 Have you registered for the Wednesday night event hosted by Life Coach Gerri, Life Coach Kathleen and me? It's all about the exclusive weight loss support groups we three co-facilitate. You'll be able to simply dial in and listen to the presentation. It'll be fantastic! I hope you can make it at 7pm Eastern-6pm Central-5pm Mountain-4pm Pacific, Wednesday June 1st. To register for this free, special conference call "open house," simply click this link and fill out the form: http://totalkathy.com/?event=dont-diet-live-it When you do, you'll receive an email giving you the special call-in number and access code. Today, I maintained the integrity of my maintenance calorie budget, I remained abstinent from refined sugar and I exceeded my daily water goal. I will aim for the same, tomorrow! I hope you're having a fabulous Memorial Day Weekend. No alarm. No place to be, too early. I slept in like a champion. It felt really awesome. I did have some work to do today, and I did it all--then grabbed an early evening nap. Yep, rest and more rest. No weather coverage to worry about today---awe...fantastic! I'm picking up Noah tomorrow afternoon and we're making our way to Stillwater to visit mom and make a trip to our family's little section of Sunset Memorial Gardens. We'll be remembering those we've lost--then, we'll enjoy a meal with mom. My dinner tonight included wild caught salmon. Jon, a good friend of mine, told me about the difference between wild caught and farm raised salmon. The calorie difference is huge! Farm raised contains almost 50% more calories. I still invest the calories in the higher fat-higher calorie farm raised, most of the time--but since my local seafood counter is out of salmon and will be for a couple weeks, it was time to take the wild caught pink salmon out of the freezer. It was really good! It's a much leaner salmon. See the dinner Tweets below! Click the poster image to enlarge! Occasionally I'll mention the small, private and "exclusive weight loss teleconference support groups" I co-facilitate with Life Coach Gerri and Kathleen Miles. We're grateful for members from all over the United States, Canada and as far away as Australia! We limit the number of members to ten for each group--twenty total. We do have some spots available for the next eight week sessions. But before you decide whether or not to sign-up, you have a special opportunity to find out what it's all about! We're presenting a very special one hour teleconference Wednesday night June 1st starting at 7pm Eastern, 6pm Central, 5pm Mountain and 4pm Pacific. You can be on the line--listen in and if you think this brand of accountability and support might work well for you, you can sign up for one of our next 8 week sessions! The new sessions start June 6th and 7th (links for registration in the next session will be made public on Monday). I hope you're having a fantastic holiday weekend! I maintained the integrity of my maintenance calorie budget, I remained abstinent from refined sugar, I made a few good support connections, I prepared some great food, I exceeded my #watergoal by 40oz and I had a great workout late tonight. Time wise, thanks to my extra sleep, it was a slightly tilted Saturday--but a really good one. A friend told me about the difference. I still buy & use the high cal. farm raised salmon. But this isn't bad at all! Great cal. value! Last night was pretty much a carbon copy of the night before. Shortly after posting last night's edition, I was off to the studio for severe weather coverage. This is part of my job duties. I'm also the morning personality--and when these two responsibilities collide, it makes for a really long next day. Once again, it was about three and a half hours sleep--and a big schedule today. I didn't realize how consuming today would become--but it's over now, and I made it through very well. I did my morning show followed by production work, then a three hour location broadcast. I planned some good mid-morning food right before the 11am-2pm broadcast with the idea that it would carry me through to a later lunch. It did, very well. I made it back to the studio and by 2:45, I was eating a late lunch and hoping to leave soon. Then, Mother Nature decided it was a great time for round three. At least today's rash of storms didn't wait until I was home and napping--nope. I barely finished lunch when the first storm warning was issued. I ran downstairs to the studio and started what I hoped would be a quick severe weather coverage. The more I studied the dry line and how it was set and moving east--and how slow the storms were moving, I quickly realized it was going to be a very very long day. I made it through, very well. The keys for me remaining consistent in the face of exhaustion and frustration started with making sure I had food in place. I packed and brought some extra things from work. If I hadn't done this--and I left my options thin, then I would have had to make some tougher decisions. When I'm tired is not the time to make food selection a difficult process. I simply make sure what I need is available. I made those choices really easy by making the options within reach. I also reached out for spot support text exchanges with a few support friends. I did this, not because I was struggling--I really wasn't, I did it because sharing the circumstance and the challenge before it becomes a major issue, lessens its potential impact. We're not alone in this unless we isolate and make it that way. By sharing the potential struggle and my plan to overcome, I avoided the real struggle. It works, I promise you! Excellent accountability and support measures are powerful tools along this road. I also enjoyed a good amount of coffee. That certainly helped in the energy department. I left the studio at almost 9:30pm, completing a fifteen hour day on little sleep. My first thought was to dine out for the second night in a row. But the more I thought about it, the more I remembered some of the things in the fridge that needed cooked--and really, I keep it simple in the kitchen, so it's not like it would take me too long to prepare something nice. And honestly, I prefer the certainty of preparing my food with proper and precise weights and measures. Had I not dined out last night, I likely would have driven straight to Ground Round Grill and Bar and ordered something--but since I did--and considering the groceries needing cooked in my fridge--and how it wouldn't take forever to do it-- I made the decision to come home and cook. I'm glad I did. It was a very late and very delicious dinner. The reward I get is hitting the pillow tonight knowing that I maintained the integrity of my maintenance calorie budget, I remained abstinent from refined sugar and I exceeded my water goal. I'm having mercy on myself in the workout department. Not that it's a major thing--but I do complete my short #morningdeal routine every single morning--but I really don't count that as a workout. I suppose my struggle over the past few days and this insane schedule--has been allowing myself to be okay without the trips to the gym. Instead of identifying places I could have squeezed it in, I'll focus on this weekend and the best times I will squeeze a great workout into my schedule. I'm sleeping in tomorrow morning without an alarm. I'll be sleeping until I'm done sleeping. Big thank yous to everyone expressing wonderful words to me about the interview on WPG-Atlantic City. Michelle Dawn Mooney's show was a wonderful experience. The audio link to the interview is posted within last night's edition. If you're a touch curious why I put forth this level of effort in maintenance mode--I'll tell you why--Because if I didn't, I could--and would most likely return to over 500 pounds. The key for me--is making what I do and what I eat, enjoyable. Because when it's truly enjoyable, the effort is enthusiastically given instead of reluctantly approached with resentment and dread . It's not forced. It's natural. Developing and allowing our plan to evolve in harmony with where we are, today--gives us the best chance at amazing tomorrows. Super long day. My first instinct was to dine out for a late dinner. But I dined out last night. I'm preparing dinner now. The weather coverage kept me up last night until 1:30am at the studio--then home, posted a Tweets Only blog post--and finally was able to fall asleep a little after 2am. A colleague covered the 6am hour of my show, thank goodness. Today was rough and challenging. On a day like this, I must embrace a higher self-awareness. I made sure I had food options in place and I especially made sure to engage in support communications. The storms held off this afternoon and that was a good thing. It gave me just enough time to get home and manage a nap before my commitment at the theatre. I did the opening audience welcome and announcements at a big concert tonight. I hated to miss 80% of it, but I had to go. The possibility of storms again tonight shaped my choices. And storms are headed toward us, again--so as soon as I post this, I'm out the door to cover more late night/early morning weather--and tomorrow will be similar to today as far as what I must do to remain in a positive mindset despite exhaustion. Good support and solid planning is critical on days like this. "Sean, I love that you keep it simple and smart!! Question...how far out in advance do you plan/prepare your meals, snacks, etc.?" Great question, Mary. To me, simple is sustainable. If I make it too complicated, I might not enjoy it as much! I'll evolve naturally at a nice measured pace! Planning and preparing--very important topic, and it's different for each person. For me--I don't like pre-cooking--preparing meals "for the week." For some, that works very very well. I'm more of an in the moment person. It doesn't mean I don't plan. I do! But my planning is this: I make sure I have several available options at home and at work. As long as I'm stocked with the foods I need and enjoy--I can make my decisions, even last minute, and be perfectly okay. Same planning with snacks-- I know what's available and I choose what I feel like having in the moment. For example-- I honestly haven't a clue what I'm having for dinner tonight. I do know a few things-- I know I'll keep it in a nice dinner range of calories, whatever it is-- and I know I have some options-- Salmon, sirloin, asparagus--maybe I'll grab some other kind of veggie at the store...a sweet potato--oh, and I have some chicken breasts that need cooked--and frozen shrimp... Hmmm... Options! They're all waiting for me to decide--and I might make the decision right before cooking! If the day gets crazy--I might decide to skip cooking and grab something out-- I have another set of go-to options in that direction. So--planning and preparing means different things for different people. The way I do it wouldn't work well for some. Now--I will add this: If I know I'm going to be out--and busy--and not near a kitchen to prepare something--I'll make sure to plan, prepare and pack (The three P's!) something for my man bag-- Usually it's what I call an "on-the-go meal" consisting of almonds, fruit and cheese...In fact, I'll likely being doing that very thing tomorrow midday. The central idea is to have what you need when and where you need it-- and then you can decide. Make sense? Thanks for the great question! It says "Sean A Addams" on the file-- but it's me!! Michelle had my name correct during the live on-air interview. Okay--I'm letting the Tweets tell the rest of today's story. I'm headed to the studio! Very necessary "Tweets Only" version tonight! Entire pan: 385g of fresh catfish. I cut my serving down to a generous 300g. Corn meal, salt&pepper, seasoned salt & egg white to stick it. Canceling workout. Checked radar- headed to studio for weather coverage. May or may not come back. Depends on how long this coverage takes. Skipping my #lastfoodofday Leaving 94 calories on the table. It's 1:19am. Just finished work. Only have a few hours to sleep. I'm not sure what sparked it, but I've heard from several people today who have expressed gratitude for what I do in this daily record. It fills my heart with the most amazing feeling when I hear different stories of how what I'm sharing about my journey is helping someone, somewhere. It's one of the greatest blessings of my life. Thank you for being a part of this study. And it is a study, really. Allowing the space and time to sit down and explore the many facets of this entire experience, along the way, as it's unfolded, has been a most amazing education. And just as some professions are required to complete ongoing education, so am I--every day. I'm always learning along this road. I hope and pray I never again get lost in the fog of pride and ego, and somehow forget this critically important part. It's very much a continuous evolution--and as it grows it demands study and understanding. If a closed mind cuts off the flow of this ongoing education, becoming lost happens quickly. I've been there. Lost is not a fun place. 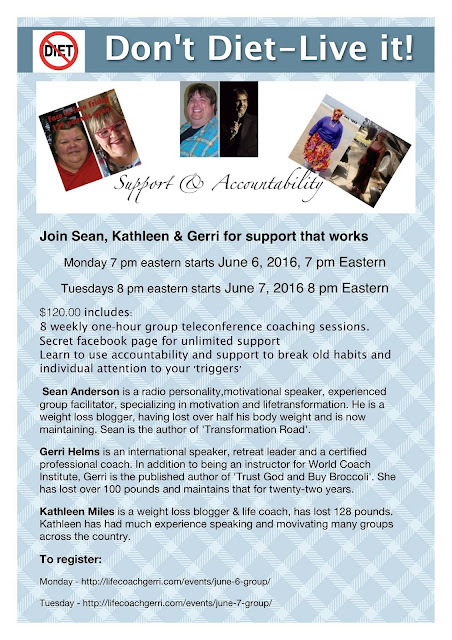 As you may or may not know, I co-facilitate an exclusive set of weekly teleconference weight loss support groups with Life Coach Gerri Helms and fellow weight loss blogger, Kathleen Miles. On Wednesday evening June 1st at 7pm Eastern, 6pm Central, 5pm Mountain and 4pm Pacific, we're hosting a free hour long opportunity for you to dial in, listen and discover what these support groups are all about. You'll hear from Gerri, Kathleen and Me, plus you'll hear from members sharing stories of their experience. Our next sessions start June 6th and 7th. I hope you'll register with the link below. When you do, you'll be on the list to receive an email in the coming days with the number and dial in access code. Today was fabulous. I maintained the integrity of my maintenance calorie budget, I remained abstinent from refined sugar and I exceeded my daily water goal. The support interactions were numerous and wonderful, too. My goal is to do it again tomorrow! I'm grateful for so many things. Counting my blessings tonight. @SeanAAnderson I'm so glad you share this morning/wake up routine because I've been doing this for two weeks now and I Love it! I've written about the "life stream" and the "fundamental elements stream" and how they must run parallel to one another and not cross. I've had several challenges of late where I really had to remember the power of this "parallel streams" philosophy. I've discovered, when life demands more attention, we don't have to let go of the elements giving us our success, but we can scale back the amount of energy it uses to operate. We don't sacrifice the integrity of the elements, we just do what we can do. For me--on super busy days, I have three requirements: 1. Stay within my calorie budget 2. Hold my abstinence from sugar sacred 3. Send the accountability tweets and write this blog--even if it's just the tweets of the day. I shared with some support buddies that if I exercised tonight it would be a bonus. I made the bonus! I had a good workout. My calorie budget is solid, I abstained from sugar, I live-tweeted the accounts of my food and exercise and I've written this blog. I'll hit the pillow realizing that my "life stream" required a little more attention today, but it didn't cross over and become road blocks for my "fundamental elements stream." This perspective helps me balance. Keeping the "Life Stream" and "Fundamental Elements Stream" from getting entangled isn't always easy. The first thought in getting to a place where it's clearer, in my opinion, is recognizing that food doesn't fix things. Excess food doesn't help change things needing attention in our lives--or make things we wish wasn't a part of our lives, or story, go away. The best it ever was for me, was a distraction--a temporary escape into a world of great tastes, complete with illusions of comfort and peace. The binge episodes of my great escapes never once provided perspective, understanding, compassion or solutions for my issues. But it was my answer, every time. It was my go-to in times of stress, in times of high emotion--the low times and yes, even the good times. Because eventually, I allowed the excessive amounts of food to buffer everything, leaving me in a constant state of emotional vacancy and abundantly full, many times to the point of sickness. This constant avoidance of feelings, translated to a stunted emotional growth--and this lack of emotional maturity affected most everything in my life in a negative fashion. The emotional growth I've experienced throughout the seven plus years of this transformation has been ten times, maybe more than what it was in the adult years leading up to its beginning. When I stopped stuffing my emotions down--suffocating them with excessive food, that's when I started feeling things in their purest form. And that's where the avenues of support become critically important--spiritually, through like minded people in support groups--and through our individual exploration via writing and expressing ourselves--maybe it's in a private diary, a journal--or even a blog like this. However it's done, it's important. Therapy--some sort of counseling, can be HUGE, too--it was for me. And then, the more experience we amass in sorting out our emotions, the better equipped we become in handling things, come what may. And at that point, maintaining separation of these streams doesn't seem so impossible. Did I reach a point where I retreated back to excessive food? Of course I did. If you're a regular reader, you're fully aware of my 164 pound relapse/regain. When I ran back the other way, it was after I threw down every tool I had collected along the way. The accountability and support measures--gone, tossed them aside. The writing out how I was feeling along the way? Yeah--didn't think I needed it anymore. I had convinced myself that I was solid as a rock and could easily do it on my own. I had it figured out, by golly. Oh dear--what a humbling 164 pounds of regain provided me...and I'm so grateful it did. Upon starting my turnaround from regain, I added abstinence from refined sugar to my plan. Suddenly, the binge trigger bio-chemical reactions were no longer affecting the addiction center of my brain--and like an answer to a prayer, it made everything much clearer, more peaceful and relatively stable. This stable foundation continues to provide a platform for continued growth. And I'm always evolving, growing, learning and living. I do not know it all. I cannot do this on my own. I'm holding the many hands of support every single mile along this road. Tonight's dinner features leftover food that needed cooked ASAP or tossed. I'm doing better at not wasting food! Too much of that, before. Home body weight strength training, tonight. The plan: 30 push-ups 3/10, 20 squats 2/10, two planks- min 30 sec-goal-60sec., 1 min wall sit. Workout complete. Tried to do video of my "plank face," but it was just too much breathing & grunting. Not pretty. Great core work, though!